The most popular holi drink adds more than just joy to the colorful festival of Holi. 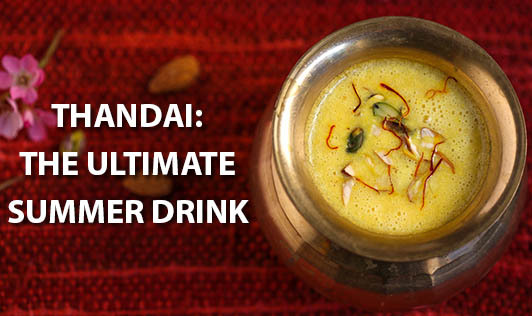 Thandai has an array of spices and dry fruits that not only cools down our system, but has other health benefits too. Milk: Packed with good quality protein and calcium, it helps to strengthen bones and teeth. Cold milk also acts as an antacid and has a cooling effect on the body. Fennel seeds: The volatile oils of fennel seeds act as antioxidants and have anti flatulence and cooling properties. Peppercorn: The pungent spice is rich in potassium, iron, vitamin K and magnesium. It has antibacterial properties and is often used for treating cold and cough. It is also seen to improve digestion. Melon seeds: These are a good source of protein, energy and iron. Rose petals: The pink soft petals, often used as gulkand has a number of health benefits. It alleviates heat related problems like tiredness and lethargy, and rejuvenates the body. It also improves appetite, digestion and effectively alleviates menstrual pain. Poppy seeds: Poppy seeds are a good source of dietary fiber and B complex vitamins. Saffron: The golden spice has been traditionally used to treat asthma, insomnia, menstrual cramps, infertility and depression. Saffron has aphrodisiac, antiseptic and antioxidant properties and is also known to enhance complexion. The health benefits of thandai are countless. It may be the perfect drink to grab this summer, but watch your calories too!